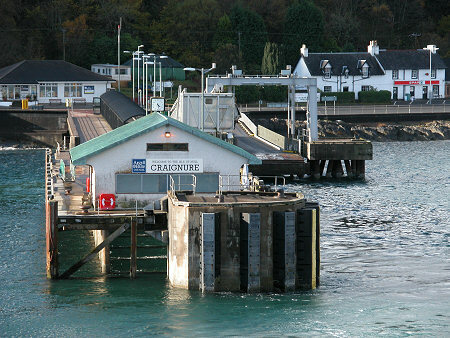 Craignure lies close to Mull's easternmost point, and it is reasonably equidistant from the island's two other main destinations for visitors: Tobermory to the north and Iona to the west. 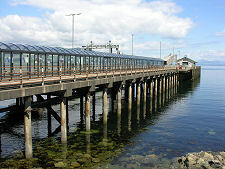 It is therefore a logical place for the main terminus for the ferries from Oban, and for many years that is exactly what it has been. But before you simply disembark from the ferry and head, as fast as Mull's mainly single track roads will allow, for either of those destinations, it is worth remembering that this small corner of Mull offers visitors a great deal to see and do. 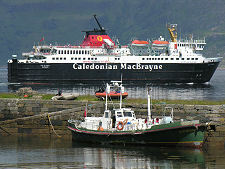 This shouldn't be too much of a surprise as you will have seen one of the area's attractions while still on the ferry. The final part of the ferry's approach to Mull is dominated by the presence of Duart Castle, standing magnificently on its outcrop of rock near the very easternmost tip of Mull. 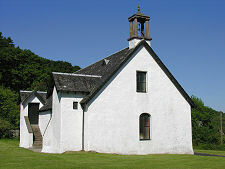 This had been held by the Macleans of Duart for over 300 years until they backed the losing side in the 1689 Jacobite uprising and had their estates confiscated. The 26th Chief of Clan Maclean purchased the ruined castle and peninsula on which it stands in 1911. 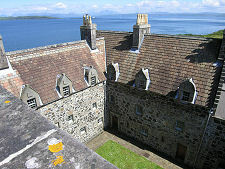 He restored it to the glorious castle you can see today, a home to the Chief of the Clan and his family, as well as providing a point of reference for Clan Maclean, whereve r in the world its widely scattered members now actually live. More observant ferry passengers can also catch a glimpse of another of what used to be the area's attractions while still en route. 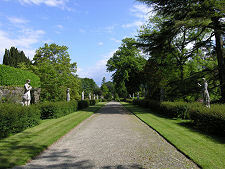 In a far more sheltered location than Duart Castle, and the opposite side of Duart Bay from it, stands Torosay Castle, a superb Victorian mansion surrounded by magnificent gardens. 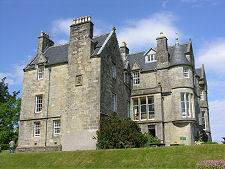 Torosay Castle was sold in 2012 and is no longer open to the pubic. The Lairds of Torosay were also responsible for another attraction this corner of Mull used to offer: this time a rather unexpected one. 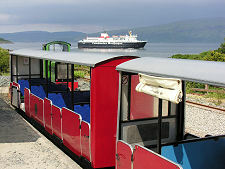 In 1984 the Isle of Mull Railway began running narrow gauge passenger trains between a station on the south side of Craignure Bay, not far from the ferry terminus, and Torosay Castle. Sadly the railway has now permanently closed. 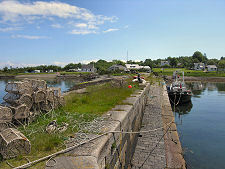 Craignure itself is fairly thinly scattered around the shores of Craignure Bay. 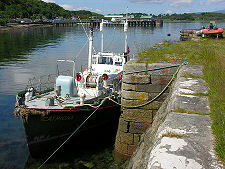 The focus for visitors tends to be on the west side of the bay at the end of the ferry pier built in 1964 and now used by the Oban Ferry, the MV Isle of Mull. 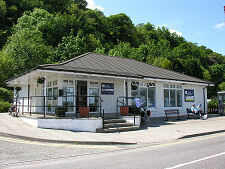 Here you find one of the island's two Tourist Information Centres, combined with the ferry booking office; plus a number of shops, and Craignure's rather inadequate public loos. 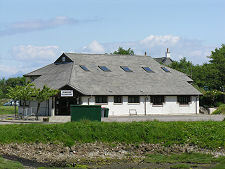 Neatly between these two main chunks of village lies the Craignure Inn, set just to the west of the main road. 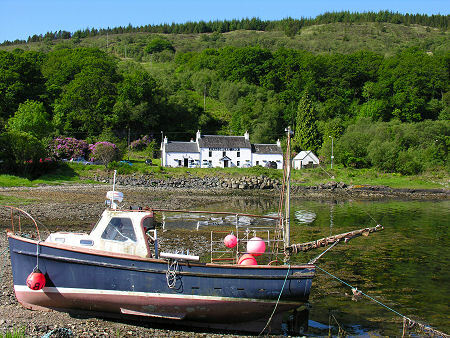 With a charming atmosphere that comes from having been an inn since at least the early 1700s, the Craignure Inn serves some of the best, and certainly best value, food you are likely to find on Mull, and it also provides accommodation.